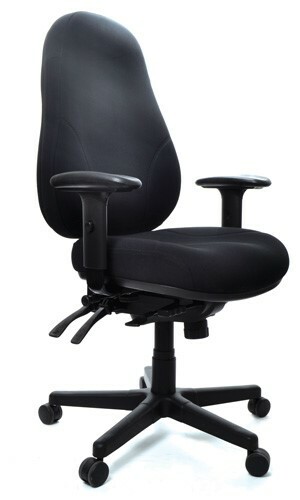 The Gregory Inca Extra High Heavy Duty is a dual density ergonomic office chair specifically designed for larger users. With a weight load of up to 150 kg, the Inca heavy Duty delivers on comfort and reliability with its seat foam technology. If you require a heavy duty office chair that provides outstanding comfort during a long work day, than look no further. The Gregory Inca range are some of our most popular selling chairs because of their innovative design and high comfort levels. The dual density seat foam firmly places you in a secure position and stops your pelvis from shifting forward on your seat. This technology allows your spine to sit in a healthy “S” shape duringprolonged periods of sitting. Outstanding quality and stability are assured with a steel substructure under the seat and a cast aluminum base. Your neck will always be supported with an extra high back, and height adjustable arms for increased support.